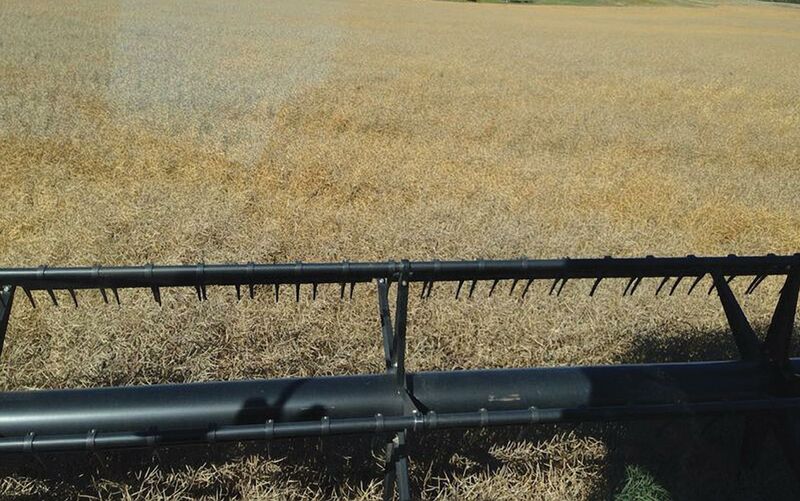 Studies have found that lower harvest losses in canola are associated with higher yield potential, especially when straight combining. This could be attributed to the additional strategies high-yielding growers carry out earlier in the season, such as seeding early, early weed control and frequent field scouting. Key practice: Reducing harvest losses starts with strong crop establishment, adequate fertilization, early weed control and frequent scouting. Key research: Liu, C., Agriculture and Agri-Food Canada (AAFC), et al. “Evaluation of On-Farm Crop Management Decisions on Canola Productivity.” Canadian Journal of Plant Science (2014). Watson, P.R., Alberta Research Council, et al. “Canola Harvest Management Study.” Canola Agronomic Research Program project (2008). A 2014 study by Chang Lui et al reported 24 percent greater seed yield when canola was straight combined instead of swathed. The sample size was small — only six growers in this study straight combined compared to 55 who swathed. But the study brought up an interesting point: a portion of the success growers who straight combined enjoyed may have been due to the other management strategies, such as the use of pre-seed weed control, which they all used. Similarly, it has been estimated that a portion of the seed yield increase attributed to straight combining is due to the extended time the seeds are allowed to mature before the crop is cut. Deliberate management techniques, such as accurately assessing the stage of seed development, can be crucial to the success of straight combining experiences. Paying special attention to seeding rate and speed, seed placement (which promotes uniform maturity later in the season) as well as variety selection (for improved pod shatter tolerance) can increase the potential for a successful experience with straight combining. A field that is well knit-together, yet not excessively branched, with uniform maturity, good pod integrity and good standability is also thought to deliver best results when straight cutting. In addition, a study called: “Canola Harvest Management” by Paul Watson et al determined that growers who straight combined canola also generally seeded early, adhered to an adequate nitrogen fertility program, used high seeding rates and maintained early weed removal as part of their crop manage-ment. While some of these strategies may have had more impact on the final yield than others, this study found that increased fertility was the most important factor for improving potential yield, and thereby increasing the chance of success (as measured by yield) for straight combining. The importance of greater crop density and early weed removal were also reported, but they tended to be dependent on the location and year. Straight cutting is also more successful when the crop has even maturity. This can be achieved by planting at a rate adequate to produce seven to 10 plants per square foot, which will keep branching to a minimum, allow a buffer against plant losses due to various pests and environmental stresses throughout the season, and provide plants with the vigour required to outcompete weeds. Further support was provided by Rob Gulden’s 2010-13 study: “Evaluation of Harvest Losses and Their Causes in Canola Across Western Canada,” which found that lower harvest losses were associated with higher yielding crops. This could be attributed to the additional successful management strategies that high-yielding growers carry out earlier in the season, such as seeding early, early weed control and frequent field scouting. Chris Holzapfel had similar conclusions after his 2011 harvest management study. To reduce harvest losses, he suggested using a relatively high seeding rate in order to produce a stand with even and early maturity, while controlling disease and weed pressure.